AERI's Level One Testing, which is included at no cost, has kept our customers 100% counterfeits free. It utilizes the 50 plus inspection steps prescribed in the well respected IDEA-STD-1010 standard and the same trained and certified electrical engineers as the higher testing levels to perform the inspection. 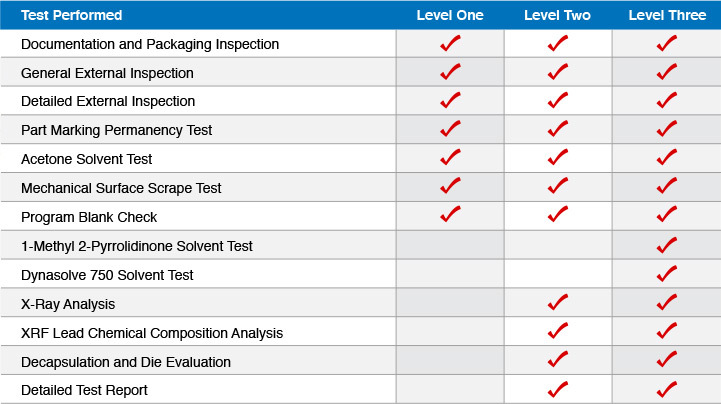 Level Two Testing was designed for the customer who is either manufacturing a product for the high reliability market and/or has strict testing requirements from their customers. This category includes the industry accepted in depth counterfeit testing such as; X-ray, XRF, Decapsulation, all with larger sample sizes and a 20+ page report. There are additional costs and time requirements.